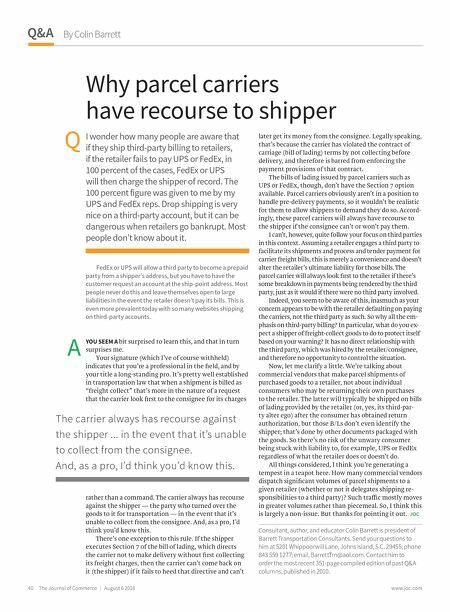 40 The Journal of Commerce | August 6 2018 www.joc.com By Colin Barrett Q&A A Q Why parcel carriers have recourse to shipper I wonder how many people are aware that if they ship third-party billing to retailers, if the retailer fails to pay UPS or FedEx, in 100 percent of the cases, FedEx or UPS will then charge the shipper of record. The 100 percent figure was given to me by my UPS and FedEx reps. Drop shipping is very nice on a third-party account, but it can be dangerous when retailers go bankrupt. Most people don't know about it. FedEx or UPS will allow a third party to become a prepaid party from a shipper's address, but you have to have the customer request an account at the ship-point address. Most people never do this and leave themselves open to large liabilities in the event the retailer doesn't pay its bills. This is even more prevalent today with so many websites shipping on third-party accounts. YOU SEEM A bit surprised to learn this, and that in turn surprises me. Your signature (which I've of course withheld) indicates that you're a professional in the field, and by your title a long-standing pro. It's pretty well established in transportation law that when a shipment is billed as "freight collect" that's more in the nature of a request that the carrier look first to the consignee for its charges rather than a command. 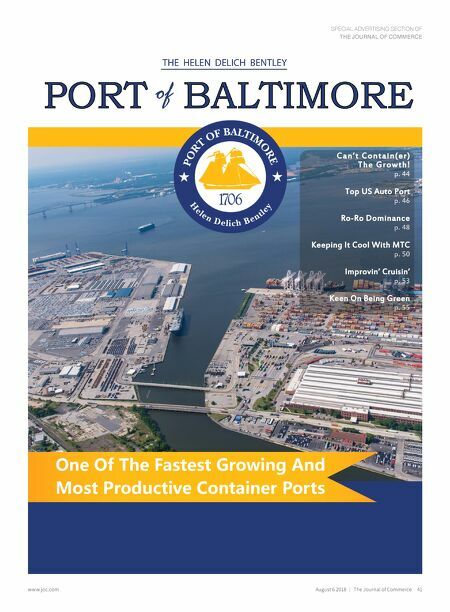 The carrier always has recourse against the shipper — the party who turned over the goods to it for transportation — in the event that it's unable to collect from the consignee. And, as a pro, I'd think you'd know this. There's one exception to this rule. If the shipper executes Section 7 of the bill of lading, which directs the carrier not to make delivery without first collecting its freight charges, then the carrier can't come back on it (the shipper) if it fails to heed that directive and can't later get its money from the consignee. Legally speaking, that's because the carrier has violated the contract of carriage (bill of lading) terms by not collecting before delivery, and therefore is barred from enforcing the payment provisions of that contract. The bills of lading issued by parcel carriers such as UPS or FedEx, though, don't have the Section 7 option available. Parcel carriers obviously aren't in a position to handle pre-delivery payments, so it wouldn't be realistic for them to allow shippers to demand they do so. Accord- ingly, these parcel carriers will always have recourse to the shipper if the consignee can't or won't pay them. I can't, however, quite follow your focus on third parties in this context. Assuming a retailer engages a third party to facilitate its shipments and process and tender payment for carrier freight bills, this is merely a convenience and doesn't alter the retailer's ultimate liability for those bills. The parcel carrier will always look first to the retailer if there's some breakdown in payments being rendered by the third party, just as it would if there were no third party involved. Indeed, you seem to be aware of this, inasmuch as your concern appears to be with the retailer defaulting on paying the carriers, not the third party as such. So why all the em- phasis on third-party billing? In particular, what do you ex- pect a shipper of freight-collect goods to do to protect itself based on your warning? It has no direct relationship with the third party, which was hired by the retailer/consignee, and therefore no opportunity to control the situation. Now, let me clarify a little. We're talking about commercial vendors that make parcel shipments of purchased goods to a retailer, not about individual consumers who may be returning their own purchases to the retailer. The latter will typically be shipped on bills of lading provided by the retailer (or, yes, its third-par- ty alter ego) after the consumer has obtained return authorization, but those B/Ls don't even identify the shipper; that's done by other documents packaged with the goods. So there's no risk of the unwary consumer being stuck with liability to, for example, UPS or FedEx regardless of what the retailer does or doesn't do. All things considered, I think you're generating a tempest in a teapot here. How many commercial vendors dispatch significant volumes of parcel shipments to a given retailer (whether or not it delegates shipping re- sponsibilities to a third party)? Such trašc mostly moves in greater volumes rather than piecemeal. So, I think this is largely a non-issue. But thanks for pointing it out. JOC Consultant, author, and educator Colin Barrett is president of Barrett Transportation Consultants. Send your questions to him at 5201 Whippoorwill Lane, Johns Island, S.C. 29455; phone 843 559 1277; email, BarrettTrn@aol.com. Contact him to order the most recent 351-page compiled edition of past Q&A columns, published in 2010. The carrier always has recourse against the shipper ... in the event that it's unable to collect from the consignee. And, as a pro, I'd think you'd know this.